Rafaella Kosta is 15 years old and she is studying at the Linopetra's lyceum in Limassol, Cyprus. She has only been singing for two years and it is something she really enjoys. Currently, she has being doing private voice lessons at the Music School Kyriakides. Rafaella is in her first year of High School. She is also attending English language classes and she likes to play tennis, use her computer and spending time with her friends. 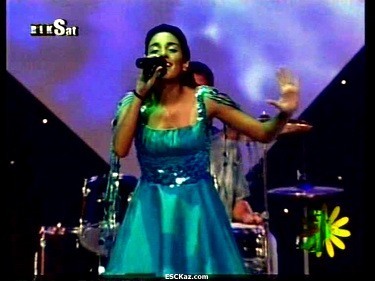 She has being involved in many singing contests and won many prizes. 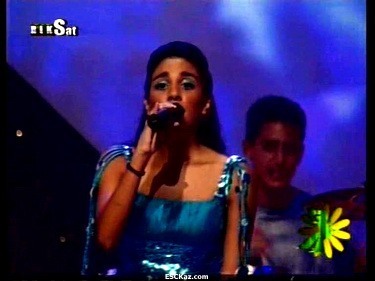 She won first prize at the High Schools national music contest singing category. 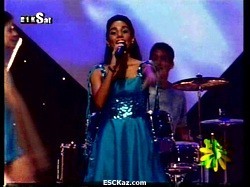 Last year she won third place at the third national Evidence Music singing contest. Rafaella would like to pursue music in the future and also become a lawyer. 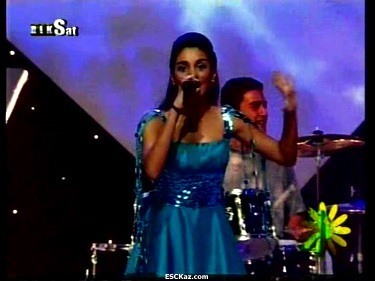 She will be representing Cyprus with the song "Thalassa Ilios Aeras Fotia" (Sea Sun Air Fire). She wrote the lyrics to the song and the music was written by her friend Martha Paradisioti. 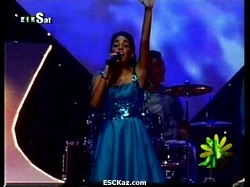 It was RafaellaвЂ™s idea to enter a song for Cyprus in the Junior Eurovision Song Contest as it was always a dream of hers to take part. Rafaella and her friend Martha met through their school where Rafaella sings in the choir and Martha plays the piano in the orchestra. Together they came up with this mellow rock song in just two days. Martha Paradisioti is fourteen years old and also lives in the same city. She has been playing the piano for eight years and plays keyboards in the song. In her spare time, Martha enjoys playing her computer and watching television. 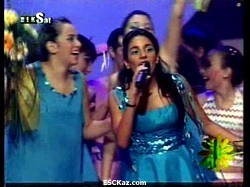 Rafaella and Martha have taken part in various musical competitions with their school. 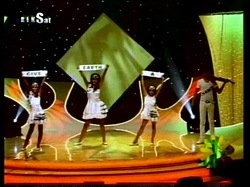 They gained the first place in a regional contest for their traditional Greek-Cypriot вЂ�rempetikoвЂ™ song. 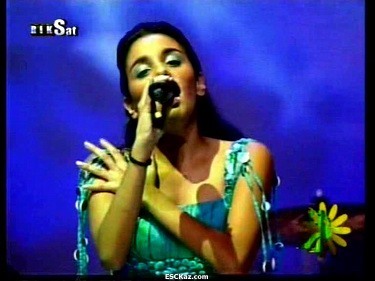 RafaellaвЂ™s inspiration for the lyrics came from stories about the past which she heard from her parents and grand-parents. The song looks at how the world has changed and compares older times and the present day. The song's arrangement was done by Christos Kyriakides. On the stage of national final Rafaella and Martha were joined by Panayiotis Stylianides (drums), Kostantinos Spirou (guitar), and dancers Christiana Hadjipiera and Elena Patsali. For international final Rafaella, Martha and Panayiotis will be joined by Demetris Spyrou, Konstantinos' brother on guitar, and line-up will omit the dancers. Kyriakos Pastides will be the CyBC commentator as usual. He has also produced a documentary about last year's Eurovision which is due to be screened in Cyprus soon. 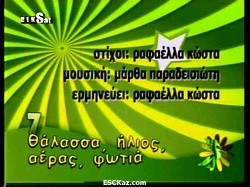 JESC 2007 entrant Yiorgos Ioanides will be spokesperson of Cyprus. 15-Р»РµС‚РЅСЏСЏ Р Р°С„Р°РµР»Р»Р° РљРѕСЃС‚Р° СѓС‡РёС‚СЃСЏ РІ Р»РёС†РµРµ Р›РёРЅРѕРїРµС‚СЂР° РІ Р›РёРјР°СЃСЃРѕР»Рµ, РљРёРїСЂ. РћРЅР° РїРѕРµС‚ РІСЃРµРіРѕ РґРІР° РіРѕРґР° Рё СЌС‚Рѕ Р·Р°РЅСЏС‚РёРµ РµР№ РѕС‡РµРЅСЊ РЅСЂР°РІРёС‚СЃСЏ. РЎРµР№С‡Р°СЃ РѕРЅР° С‚Р°РєР¶Рµ Р±РµСЂРµС‚ С‡Р°СЃС‚РЅС‹Рµ СѓСЂРѕРєРё РІРѕРєР°Р»Р° РІ РјСѓР·С‹РєР°Р»СЊРЅРѕР№ С€РєРѕР»Рµ РљРёСЂРёР°РєРёРґРµСЃ. Р Р°С„Р°РµР»Р»Р° СѓС‡РёС‚СЃСЏ РІ РїРµСЂРІРѕРј РєР»Р°СЃСЃРµ РІС‹СЃС€РµР№ СЃС‚СѓРїРµРЅРё С€РєРѕР»С‹. РћРЅР° С‚Р°РєР¶Рµ Р·Р°РЅРёРјР°РµС‚СЃСЏ Р°РЅРіР»РёР№СЃРєРёРј СЏР·С‹РєРѕРј Рё Р»СЋР±РёС‚ РёРіСЂР°С‚СЊ РІ С‚РµРЅРЅРёСЃ, РїСЂРѕРІРѕРґРёС‚СЊ РІСЂРµРјСЏ Р·Р° РєРѕРјРїСЊСЋС‚РµСЂРѕРј Рё РІСЃС‚СЂРµС‡Р°С‚СЊСЃСЏ СЃРѕ СЃРІРѕРёРјРё РґСЂСѓР·СЊСЏРјРё. РћРЅР° РїСЂРёРЅРёРјР°Р»Р° СѓС‡Р°СЃС‚РёРµ РІРѕ РјРЅРѕР¶РµСЃС‚РІРµ РјСѓР·С‹РєР°Р»СЊРЅС‹С… РєРѕРЅРєСѓСЂСЃРѕРІ Рё Р·Р°РІРѕРµРІР°Р»Р° СЂСЏРґ РїСЂРёР·РѕРІ, РІРєР»СЋС‡Р°СЏ РїРµСЂРІС‹Р№ РїСЂРёР· РЅР° РјСѓР·С‹РєР°Р»СЊРЅРѕРј РєРѕРЅРєСѓСЂСЃРµ СЃСЂРµРґРё СЃСЂРµРґРЅРёС… С€РєРѕР» РљРёРїСЂР° РІ РІРѕРєР°Р»СЊРЅРѕР№ РЅРѕРјРёРЅР°С†РёРё, Рё С‚СЂРµС‚РёР№ РїСЂРёР· РЅР° С‚СЂРµС‚СЊРµРј РµР¶РµРіРѕРґРЅРѕРј РјСѓР·С‹РєР°Р»СЊРЅРѕРј РєРѕРЅРєСѓСЂСЃРµ Evidence Music. Р’ Р±СѓРґСѓС‰РµРј Р Р°С„Р°РµР»Р»Р° С…РѕС‡РµС‚ Р·Р°РЅРёРјР°С‚СЊСЃСЏ РјСѓР·С‹РєРѕР№ РїСЂРѕС„РµСЃСЃРёРѕРЅР°Р»СЊРЅРѕ, РЅРѕ РІ С‚РѕР¶Рµ РІСЂРµРјСЏ Рё РїРѕР»СѓС‡РёС‚СЊ СЋСЂРёРґРёС‡РµСЃРєРѕРµ РѕР±СЂР°Р·РѕРІР°РЅРёРµ. РћРЅР° РїСЂРµРґСЃС‚Р°РІРёС‚ РљРёРїСЂ СЃ РїРµСЃРЅРµР№ "Thalassa Ilios Aeras Fotia" (РњРѕСЂРµ РЎРѕР»РЅС†Рµ Р’РѕР·РґСѓС… РћРіРѕРЅСЊ). Р Р°С„Р°РµР»Р»Р° СЃР°РјР° РЅР°РїРёСЃР°Р»Р° С‚РµРєСЃС‚ РїРµСЃРЅРё, РјСѓР·С‹РєСѓ Рє РєРѕС‚РѕСЂРѕР№ РЅР°РїРёСЃР°Р»Р° РµРµ РїРѕРґСЂСѓРіР° РњР°СЂС‚Р° РџР°СЂР°РґРёСЃРёРѕС‚Рё. Р­С‚Рѕ Р±С‹Р»Р° РёРґРµСЏ Р Р°С„Р°РµР»Р»С‹ - РїРѕРґР°С‚СЊ Р·Р°СЏРІРєСѓ РЅР° СѓС‡Р°СЃС‚РёРµ РІ Р”РµС‚СЃРєРѕРј Р•РІСЂРѕРІРёРґРµРЅРёРё, РїРѕС‚РѕРјСѓ С‡С‚Рѕ СѓС‡Р°СЃС‚РёРµ РІ СЌС‚РѕРј РєРѕРЅРєСѓСЂСЃРµ Р±С‹Р»Рѕ РµРµ РјРµС‡С‚РѕР№. Р Р°С„Р°РµР»Р»Р° Рё РµРµ РїРѕРґСЂСѓРіР° РњР°СЂС‚Р° РІСЃС‚СЂРµС‚РёР»РёСЃСЊ РІ С€РєРѕР»Рµ, РіРґРµ Р Р°С„Р°РµР»Р»Р° РїРѕРµС‚ РІ С…РѕСЂРµ, Р° РњР°СЂС‚Р° РёРіСЂР°РµС‚ РЅР° С„РѕСЂС‚РµРїРёР°РЅРѕ РІ РѕСЂРєРµСЃС‚СЂРµ. Р’РјРµСЃС‚Рµ РѕРЅРё РЅР°РїРёСЃР°Р»Рё СЌС‚Сѓ РїРµСЃРЅСЋ РІСЃРµРіРѕ Р·Р° РґРІР° РґРЅСЏ. РњР°СЂС‚Рµ РџР°СЂР°РґРёСЃРёРѕС‚Рё 14 Р»РµС‚ Рё РѕРЅР° С‚Р°РєР¶Рµ Р¶РёРІРµС‚ РІ Р›РёРјР°СЃСЃРѕР»Рµ. РЈР¶Рµ 8 Р»РµС‚ РѕРЅР° РёРіСЂР°РµС‚ РЅР° С„РѕСЂС‚РµРїРёР°РЅРѕ, Р° РІ РєРѕРЅРєСѓСЂСЃРЅРѕР№ РїРµСЃРЅРµ РѕРЅР° РёРіСЂР°РµС‚ РЅР° РєР»Р°РІРёС€РЅС‹С…. Р’ СЃРІРѕР±РѕРґРЅРѕРµ РІСЂРµРјСЏ РњР°СЂС‚Р° Р»СЋР±РёС‚ РёРіСЂР°С‚СЊ РЅР° РєРѕРјРїСЊСЋС‚РµСЂРµ Рё СЃРјРѕС‚СЂРµС‚СЊ С‚РµР»РµРІРёР·РѕСЂ. Р Р°С„Р°РµР»Р»Р° Рё РњР°СЂС‚Р° РїСЂРёРЅРёРјР°Р»Рё СѓС‡Р°СЃС‚РёРµ РІ СЂСЏРґРµ РјСѓР·С‹РєР°Р»СЊРЅС‹С… РєРѕРЅРєСѓСЂСЃРѕРІ СЃРѕ СЃРІРѕРµР№ С€РєРѕР»РѕР№. РћРЅРё Р·Р°РЅСЏР»Рё РїРµСЂРІРѕРµ РјРµСЃС‚Рѕ РЅР° СЂРµРіРёРѕРЅР°Р»СЊРЅРѕРј РєРѕРЅРєСѓСЂСЃРµ РёСЃРїРѕР»РЅСЏСЏ РЅР°СЂРѕРґРЅСѓСЋ РіСЂРµС‡РµСЃРєРѕ-РєРёРїСЂРёРѕС‚СЃРєСѓСЋ РїРµСЃРЅСЋ 'Rempetiko'. Р�РґРµСЏ С‚РµРєСЃС‚Р° РїРµСЃРЅРё РїСЂРёС€Р»Р° Рє Р Р°С„Р°РµР»Р»Рµ РёР· РёСЃС‚РѕСЂРёР№ Рѕ РїСЂРѕС€Р»РѕРј, РєРѕС‚РѕСЂС‹Рµ РµР№ СЂР°СЃСЃРєР°Р·С‹РІР°Р»Рё СЂРѕРґРёС‚РµР»Рё Рё Р±Р°Р±СѓС€РєР° СЃ РґРµРґСѓС€РєРѕР№. РџРµСЃРЅСЏ СЂР°СЃСЃРєР°Р·С‹РІР°РµС‚ Рѕ С‚РѕРј, РєР°Рє РёР·РјРµРЅРёР»СЃСЏ РјРёСЂ Рё СЃСЂР°РІРЅРёРІР°РµС‚ СЃС‚Р°СЂС‹Рµ РІСЂРµРјРµРЅР° СЃ РЅРѕРІС‹РјРё. РђСЂР°РЅР¶РёСЂРѕРІРєСѓ РїРµСЃРЅРё РїРѕРґРіРѕС‚РѕРІРёР» РҐСЂРёСЃС‚РѕСЃ РљРёСЂРёР°РєРёРґРµСЃ. РќР° СЃС†РµРЅРµ РЅР°С†РёРѕРЅР°Р»СЊРЅРѕРіРѕ РѕС‚Р±РѕСЂР° РІРјРµСЃС‚Рµ СЃ Р Р°С„Р°РµР»Р»РѕР№ Рё РњР°СЂС‚РѕР№ РІС‹СЃС‚СѓРїРёР»Рё РџР°РЅР°Р№РѕС‚РёСЃ РЎС‚РёР»РёР°РЅРёРґРµСЃ (СѓРґР°СЂРЅС‹Рµ), РљРѕРЅСЃС‚Р°РЅС‚РёРЅРѕСЃ РЎРїРёСЂСѓ (РіРёС‚Р°СЂР°) Рё С‚Р°РЅС†РѕРІС‰РёС†С‹ РҐСЂРёСЃС‚РёР°РЅР° РҐР°РґР¶РёРїРёРµСЂР° Рё Р•Р»РµРЅР° РџР°С†Р°Р»Рё. РќР° РјРµР¶РґСѓРЅР°СЂРѕРґРЅРѕРј С„РёРЅР°Р»Рµ РІРјРµСЃС‚Рѕ РљРѕРЅСЃС‚Р°РЅС‚РёРЅРѕСЃР° РЅР° РіРёС‚Р°СЂРµ СЃС‹РіСЂР°РµС‚ РµРіРѕ Р±СЂР°С‚ Р”РµРјРµС‚СЂРёСЃ РЎРїРёСЂСѓ Рё РІ РЅРѕРјРµСЂРµ РЅРµ РїСЂРёРјСѓС‚ СѓС‡Р°СЃС‚РёРµ С‚Р°РЅС†РѕРІС‰РёС†С‹. РљРёСЂРёР°РєРѕСЃ РџР°СЃС‚РёРґРµСЃ РєР°Рє РѕР±С‹С‡РЅРѕ СЃС‚Р°РЅРµС‚ РєРѕРјРјРµРЅС‚Р°С‚РѕСЂРѕРј CyBC. РћРЅ С‚Р°РєР¶Рµ СЃРЅСЏР» РґРѕРєСѓРјРµРЅС‚Р°Р»СЊРЅС‹Р№ С„РёР»СЊРј Рѕ Р•РІСЂРѕРІРёРґРµРЅРёРё РїСЂРѕС€Р»РѕРіРѕ РіРѕРґР°, РєРѕС‚РѕСЂС‹Р№ СЃРєРѕСЂРѕ Р±СѓРґРµС‚ РїРѕРєР°Р·Р°РЅ РЅР° РљРёРїСЂРµ. РЈС‡Р°СЃС‚РЅРёРє Р•РІСЂРѕРІРёРґРµРЅРёСЏ 2007 Р™РѕСЂРіРѕСЃ Р�РѕР°РЅРЅРёРґРµСЃ Р±СѓРґРµС‚ РѕР±СЉСЏРІР»СЏС‚СЊ РіРѕР»РѕСЃР° РєРёРїСЂРёРѕС‚СЃРєРѕРіРѕ РіРѕР»РѕСЃРѕРІР°РЅРёСЏ. To whom do you believe? That they tought you about in school? 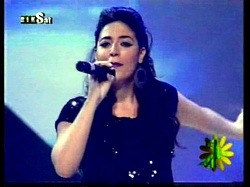 - Hello, Rafaella, and first of all our congratulations for winning Cypriot national selection! What were your first thoughts when you realized you are the winner of the competition? -My first thoughts were first of all joy and then pride because I would be representing my country in such an important competition. I also felt a bit stressed because I want to do well. - I am a cheerful person and I love all the people around me. - You're the lyricist of your entry and lyrics are considered to be pretty adult. How can you describe their message to those who don't understand Greek? - The song is a comparison between the old days and the times we live now. There used to be heroes, high ideals and true love but today these things do not exist. - After talking about this subject with my parents and grandparents a lot, I was inspired to write a song. - My plan is to practice singing and dancing every day and of course this includes regular rehearsals with all the dancers and members of the band. 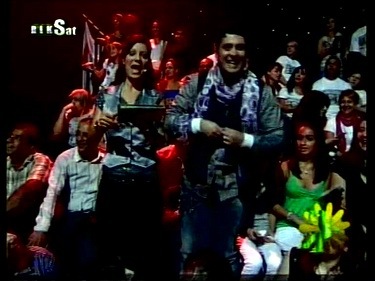 - My vocals coaches are Chryso Thrasivoulou and Christos Kyriakides and our choreographer is Annita Timotheou Marnerou. - Can you also introduce the dancers and band, who accompanied you? 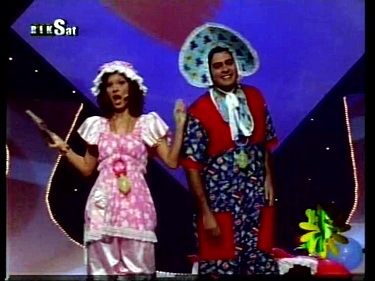 - The dancers as Christiana Hadjipiera and Elena Patsali. The band are made up of Martha Paradisioti on keyboards, Panayiotis Stylianides on drums and Constantinos Spyrou on electric guitar. - How will you visually present your entry on stage? Will it be similar performance as during Cypriot national final, or is there plan to add any visual effects for the international audience to understand better your song? 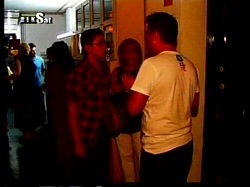 - Our presentation will not be the same as during Cypriot national final. There will be some changes but we keeping them a secret so they will be a surprise! - Last year contest took place in your home city of Lemesos? Have you attended it? - My favorite entry from last year was Bzzz, Georgia. 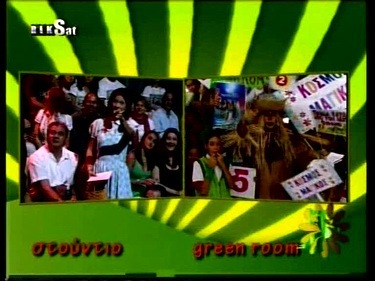 - Have you met any previous Cypriot JESC entrants? Any advices they gave to you? 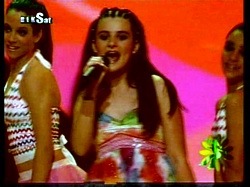 - Yes I have met previous Cypriot JESC entrants. They told me to enjoy the contest and not to get stressed. - I have already listened to the other countries competing entries. They are all very nice and I wish them all good luck. - I would like to win the competition for my country but I am looking forward to making new friends. - I go to school, return home and study and then I go to my afternoon lessons. I usually play tennis and of course sing! - My favorite school subjects are music and sport. 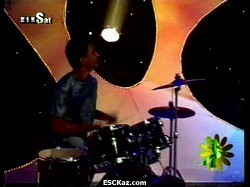 - My other biggest music achievement was with my school band. It was a competition with traditional music and we won the first prize. - Yes I like contests and I also took part in national Evidence competition. 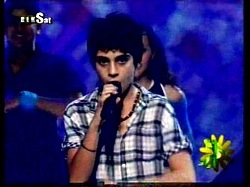 - No I donвЂ™t performing original songs only that I sing in Junior Eurovision 2009. My regular repertoire is pop, rock and Cypriot ethnic songs. - I like to listening pop music and my favorite singers are Greek artists Michalis Hadjiyiannis and Sakis Rouvas. - My plans after the contest are to study hard in school and continue with my music. I havenвЂ™t decided what to do in the future yet as IвЂ™m still very young! - I wish everyone happiness, health and to love their family and friends! - Thanks for the interview and see you in Kyiv! - РџСЂРёРІРµС‚, Р Р°С„Р°РµР»Р»Р°! РќР°С€Рё РїРѕР·РґСЂР°РІР»РµРЅРёСЏ СЃ РїРѕР±РµРґРѕР№ РЅР° РљРёРїСЂРёРѕС‚СЃРєРѕРј РѕС‚Р±РѕСЂРµ! РљР°РєР°СЏ Р±С‹Р»Р° С‚РІРѕСЏ РїРµСЂРІР°СЏ РјС‹СЃР»СЊ, РєРѕРіРґР° С‚С‹ РїРѕРЅСЏР»Р°, С‡С‚Рѕ РїРѕР±РµРґРёР»Р° РЅР° СЌС‚РѕРј РєРѕРЅРєСѓСЂСЃРµ? - РњРѕРё РїРµСЂРІС‹Рµ РјС‹СЃР»Рё Р±С‹Р»Рё РЅР°РїРѕР»РЅРµРЅС‹ СЂР°РґРѕСЃС‚СЊСЋ Рё РіРѕСЂРґРѕСЃС‚СЊСЋ Р·Р° С‚Рѕ, С‡С‚Рѕ СЏ РїСЂРµРґСЃС‚Р°РІР»СЋ СЃРІРѕСЋ СЃС‚СЂР°РЅСѓ РІ С‚Р°РєРѕРј РІР°Р¶РЅРѕРј РєРѕРЅРєСѓСЂСЃРµ. РЇ С‚Р°РєР¶Рµ РЅРµРјРЅРѕРіРѕ СЂР°Р·РІРѕР»РЅРѕРІР°Р»Р°СЃСЊ, РїРѕС‚РѕРјСѓ С‡С‚Рѕ СЏ С…РѕС‡Сѓ СѓСЃРїРµС€РЅРѕ РІС‹СЃС‚СѓРїРёС‚СЊ РЅР° РЅРµРј. - РЇ Р¶РёР·РЅРµСЂР°РґРѕСЃС‚РЅР°СЏ Рё Р»СЋР±Р»СЋ РІСЃРµС… Р»СЋРґРµР№, РєРѕС‚РѕСЂС‹Рµ РѕРєСЂСѓР¶Р°СЋС‚ РјРµРЅСЏ. - РўС‹ СЃР°РјР° РЅР°РїРёСЃР°Р»Р° С‚РµРєСЃС‚ Рє СЃРІРѕРµР№ РїРµСЃРЅРµ, РєРѕС‚РѕСЂС‹Р№ РґРѕСЃС‚Р°С‚РѕС‡РЅРѕ РІР·СЂРѕСЃР»С‹Р№. РљР°Рє С‚С‹ РјРѕР¶РµС€СЊ РѕРїРёСЃР°С‚СЊ СЃРјС‹СЃР» РїРµСЃРЅРё С‚РµРј, РєС‚Рѕ РЅРµ РїРѕРЅРёРјР°РµС‚ РіСЂРµС‡РµСЃРєРѕРіРѕ? - РџРµСЃРЅСЏ СЃСЂР°РІРЅРёРІР°РµС‚ СЃС‚Р°СЂРёРЅСѓ Рё РґРЅРё, РІ РєРѕС‚РѕСЂС‹Рµ РјС‹ Р¶РёРІРµРј. Р’ РґР°РІРЅРёРµ РІСЂРµРјРµРЅР° Р±С‹Р»Рё РіРµСЂРѕРё, РІС‹СЃРѕРєРёРµ РёРґРµР°Р»С‹ Рё РЅР°СЃС‚РѕСЏС‰Р°СЏ Р»СЋР±РѕРІСЊ, РЅРѕ СЃРµР№С‡Р°СЃ С‚Р°РєРёРµ РІРµС‰Рё РїРѕРїСЂРѕСЃС‚Сѓ РЅРµ СЃСѓС‰РµСЃС‚РІСѓСЋС‚. - РџРѕСЃР»Рµ С‚РѕРіРѕ, РєР°Рє РјС‹ СЃ СЂРѕРґРёС‚РµР»СЏРјРё Рё РјРѕРёРјРё Р±Р°Р±СѓС€РєРѕР№ СЃ РґРµРґСѓС€РєРѕР№ РјРЅРѕРіРѕ РѕР±СЃСѓР¶РґР°Р»Рё СЌС‚Сѓ С‚РµРјСѓ, СЏ СЂРµС€РёР»Р° РЅР°РїРёСЃР°С‚СЊ РѕР± СЌС‚РѕРј РїРµСЃРЅСЋ. - РљР°РєРёРµ Сѓ С‚РµР±СЏ РїР»Р°РЅС‹ РїРѕРґРіРѕС‚РѕРІРєРё Рє РєРѕРЅРєСѓСЂСЃСѓ? - РЇ РїР»Р°РЅРёСЂСѓСЋ РїСЂР°РєС‚РёРєРѕРІР°С‚СЊ РІРѕРєР°Р» Рё С‚Р°РЅС†С‹ РєР°Р¶РґС‹Р№ РґРµРЅСЊ, Рё, РєРѕРЅРµС‡РЅРѕ СЌС‚Рѕ РІРєР»СЋС‡Р°РµС‚ РІ СЃРµР±СЏ СЂРµРіСѓР»СЏСЂРЅС‹Рµ СЂРµРїРµС‚РёС†РёРё СЃРѕ РІСЃРµРјРё С‚Р°РЅС†РѕСЂР°РјРё Рё СѓС‡Р°СЃС‚РЅРёРєР°РјРё РіСЂСѓРїРїС‹. - РњРѕРё РїСЂРµРїРѕРґР°РІР°С‚РµР»Рё РїРѕ РІРѕРєР°Р»Сѓ РҐСЂРёСЃРѕ РўСЂР°СЃРёРІРѕР»Сѓ Рё РҐСЂРёСЃС‚РѕСЃ РљРёСЂРёР°РєРёРґРµСЃ, РЅР°С€ С…РѕСЂРµРѕРіСЂР°С„ - РђРЅРЅРёС‚Р° РўРёРјРѕС‚РµСѓ РњР°СЂРЅРµСЂСѓ. - РџСЂРµРґСЃС‚Р°РІСЊ РЅР°Рј, РїРѕР¶Р°Р»СѓР№СЃС‚Р°, С‚РІРѕРёС… РґСЂСѓР·РµР№, РєРѕС‚РѕСЂС‹Рµ РІС‹СЃС‚СѓРїСЏС‚ СЃ С‚РѕР±РѕР№ РЅР° СЃС†РµРЅРµ? - РўР°РЅС†РѕСЂС‹ - РҐСЂРёСЃС‚РёР°РЅР° РҐР°РґР¶РёРїРёРµСЂР° Рё Р•Р»РµРЅР° РџР°С‚СЃР°Р»Рё. Р“СЂСѓРїРїР° СЃРѕСЃС‚РѕРёС‚ РёР· РњР°СЂС‚С‹ РџР°СЂР°РґРёСЃРёРѕС‚Рё РЅР° РєР»Р°РІРёС€РЅС‹С…, РџР°РЅР°Р№РѕС‚РёСЃ РЎС‚РёР»РёР°РЅРёРґРµСЃ РЅР° Р±Р°СЂР°Р±Р°РЅР°С… Рё РљРѕРЅСЃС‚Р°РЅС‚РёРЅРѕСЃ РЎРїРёСЂСѓ РЅР° СЌР»РµРєС‚СЂРѕРіРёС‚Р°СЂРµ. - РќР°С€Рµ РІС‹СЃС‚СѓРїР»РµРЅРёРµ РїСЂРµС‚РµСЂРїРµР»Рѕ РёР·РјРµРЅРµРЅРёСЏ. Р‘СѓРґСѓС‚ РЅРµСЃРєРѕР»СЊРєРѕ СЃСЋСЂРїСЂРёР·РѕРІ, РЅРѕ РїРѕРєР° РјС‹ РёС… РґРµСЂР¶РёРј РІ СЃРµРєСЂРµС‚Рµ, С‡С‚РѕР±С‹ РѕРЅРё СЃС‚Р°Р»Рё РЅР°СЃС‚РѕСЏС‰РёРјРё СЃСЋСЂРїСЂРёР·Р°РјРё! - Р’ РїСЂРѕС€Р»РѕРј РіРѕРґСѓ РєРѕРЅРєСѓСЂСЃ РїСЂРѕС…РѕРґРёР» РІ С‚РІРѕРµРј СЂРѕРґРЅРѕРј РіРѕСЂРѕРґРµ Р›РёРјР°СЃСЃРѕР»Рµ. РўС‹ С…РѕРґРёР»Р° РЅР° РЅРµРіРѕ? - Рљ СЃРѕР¶Р°Р»РµРЅРёСЋ, СЏ РЅРµ СЃРјРѕРіР»Р° РЅР°Р№С‚Рё Р±РёР»РµС‚ Рё СЃРјРѕС‚СЂРµР»Р° РєРѕРЅРєСѓСЂСЃ РїРѕ С‚РµР»РµРІРёР·РѕСЂР°. - РџРѕРЅСЂР°РІРёР»РёСЃСЊ Р»Рё С‚РµР±Рµ РєР°РєРёРµ-С‚Рѕ РїРµСЃРЅРё? - РњРѕРёРј С„Р°РІРѕСЂРёС‚РѕРј РІ РїСЂРѕС€Р»РѕРј РіРѕРґСѓ Р±С‹Р»Рё РїСЂРµРґСЃС‚Р°РІРёС‚РµР»Рё Р“СЂСѓР·РёРё Bzikebi. - Р”Р°, СЏ РІСЃС‚СЂРµС‡Р°Р»Р°СЃСЊ СЃ РЅРµРєРѕС‚РѕСЂС‹РјРё РёР· РЅРёС…. РћРЅРё СЂРµРєРѕРјРµРЅРґРѕРІР°Р»Рё РјРЅРµ РїРѕР»СѓС‡Р°С‚СЊ СѓРґРѕРІРѕР»СЊСЃС‚РІРёРµ Рё РЅРµ РІРѕР»РЅРѕРІР°С‚СЊСЃСЏ. - Р”Р°, СЏ СѓР¶Рµ РїСЂРѕСЃР»СѓС€Р°Р»Р° РїРµСЃРЅРё РґСЂСѓРіРёС… СѓС‡Р°СЃС‚РІСѓСЋС‰РёС… СЃС‚СЂР°РЅ. РћРЅРё РІСЃРµ РѕС‡РµРЅСЊ С…РѕСЂРѕС€РёРµ Рё СЏ Р¶РµР»Р°СЋ РІСЃРµРј СѓС‡Р°СЃС‚РЅРёРєР°Рј СѓРґР°С‡Рё. - РљРѕРЅРµС‡РЅРѕ, СЏ Р±С‹ С…РѕС‚РµР»Р° РїРѕР±РµРґРёС‚СЊ РЅР° РєРѕРЅРєСѓСЂСЃРµ, РЅРѕ СЏ С…РѕС‡Сѓ Рё Р·Р°РІРµСЃС‚Рё РЅРѕРІС‹С… РґСЂСѓР·РµР№. - Р Р°СЃСЃРєР°Р¶Рё РЅР°Рј, РєР°Рє РІС‹РіР»СЏРґРёС‚ С‚РІРѕР№ РѕР±С‹С‡РЅС‹Р№ РґРµРЅСЊ? Р§РµРј С‚С‹ РѕР±С‹С‡РЅРѕ Р·Р°РЅРёРјР°РµС€СЊСЃСЏ? Р§С‚Рѕ РґРµР»Р°РµС€СЊ РІ СЃРІРѕР±РѕРґРЅРѕРµ РІСЂРµРјСЏ? - РЇ С…РѕР¶Сѓ РІ С€РєРѕР»С‹, РІРѕР·РІСЂР°С‰Р°СЋСЃСЊ РґРѕРјРѕР№, РґРµР»Р°СЋ СѓСЂРѕРєРё. РЇ С‚Р°РєР¶Рµ РѕР±С‹С‡РЅРѕ РёРіСЂР°СЋ РІ С‚РµРЅРЅРёСЃ, РЅСѓ, Рё РєРѕРЅРµС‡РЅРѕ, РїРѕСЋ! - Р­С‚Рѕ РїРµРЅРёРµ Рё С„РёР·РєСѓР»СЊС‚СѓСЂР°. - Р§С‚Рѕ С‚С‹ СЃС‡РёС‚Р°РµС€СЊ СЃРІРѕРёРј СЃР°РјС‹Рј Р±РѕР»СЊС€РёРј РґРѕСЃС‚РёР¶РµРЅРёРµРј РІ РјСѓР·С‹РєРµ, РїРѕРјРёРјРѕ РїРѕР±РµРґС‹ РЅР° РѕС‚Р±РѕСЂРµ Рє Р•РІСЂРѕРІРёРґРµРЅРёСЋ? - Р­С‚Рѕ СѓС‡Р°СЃС‚РёРµ РІ РєРѕРЅРєСѓСЂСЃРµ С‚СЂР°РґРёС†РёРѕРЅРЅРѕР№ РјСѓР·С‹РєРµ СЃ РјРѕРµР№ РіСЂСѓРїРїРѕР№, РіРґРµ РјС‹ Р·Р°РІРѕРµРІР°Р»Рё РїРµСЂРІРѕРµ РјРµСЃС‚Рѕ. - РўРµР±Рµ РІРѕРѕР±С‰Рµ РЅСЂР°РІРёС‚СЃСЏ РїСЂРёРЅРёРјР°С‚СЊ СѓС‡Р°СЃС‚РёРµ РІ РєРѕРЅРєСѓСЂСЃР°С…? Р’ РєР°РєРёС… РµС‰Рµ С‚С‹ РІС‹СЃС‚СѓРїР°Р»Р°? - Р”Р°, РјРЅРµ РЅСЂР°РІСЏС‚СЃСЏ РєРѕРЅРєСѓСЂСЃС‹ Рё СЏ РїСЂРёРЅРёРјР°Р»Р° СѓС‡Р°СЃС‚РёРµ РІ РЅР°С†РёРѕРЅР°Р»СЊРЅРѕРј РєРѕРЅРєСѓСЂСЃРµ Evidence. - РЈ С‚РµР±СЏ РјРЅРѕРіРѕ РѕСЂРёРіРёРЅР°Р»СЊРЅС‹С… РїРµСЃРµРЅ, РёР· С‡РµРіРѕ СЃРѕСЃС‚РѕРёС‚ С‚РІРѕР№ РѕР±С‹С‡РЅС‹Р№ СЂРµРїРµСЂС‚СѓР°СЂ? - РќРµС‚, РµРґРёРЅСЃС‚РІРµРЅРЅР°СЏ РјРѕСЏ РѕСЂРёРіРёРЅР°Р»СЊРЅР°СЏ РїРµСЃРЅСЏ - СЌС‚Рѕ С‚Р°, РєРѕС‚РѕСЂСѓСЋ СЏ Р±СѓРґСѓ РёСЃРїРѕР»РЅСЏС‚СЊ РЅР° Р•РІСЂРѕРІРёРґРµРЅРёРё. Р’РѕРѕР±С‰Рµ СЏ РїРѕСЋ РїРѕРї, СЂРѕРє Рё РєРёРїСЂРёРѕС‚СЃРєРёР№ С„РѕР»СЊРєР»РѕСЂ. - РЇ Р»СЋР±Р»СЋ СЃР»СѓС€Р°С‚СЊ РїРѕРї РјСѓР·С‹РєСѓ, РјРѕРё Р»СЋР±РёРјС‹Рµ РёСЃРїРѕР»РЅРёС‚РµР»Рё - РїРµРІС†С‹ РёР· Р“СЂРµС†РёРё РњРёС…Р°Р»РёСЃ РҐР°РґР¶РёР№Р°РЅРЅРёСЃ Рё РЎР°РєРёСЃ Р СѓРІР°СЃ. - РџРѕСЃР»Рµ РєРѕРЅРєСѓСЂСЃР° СЏ РїР»Р°РЅРёСЂСѓСЋ СЃРєРѕРЅС†РµРЅС‚СЂРёСЂРѕРІР°С‚СЊСЃСЏ РЅР° СѓС‡РµР±Рµ Рё РїСЂРѕРґРѕР»Р¶РёС‚СЊ Р·Р°РЅРёРјР°С‚СЊСЃСЏ РјСѓР·С‹РєРѕР№. РџРѕРєР° СЏ РµС‰Рµ РЅРµ СЂРµС€РёР»Р°, С‡РµРј СЏ Р±СѓРґСѓ Р·Р°РЅРёРјР°С‚СЊСЃСЏ РІ Р±СѓРґСѓС‰РµРј, РїРѕС‚РѕРјСѓ С‡С‚Рѕ СЏ РµС‰Рµ РѕС‡РµРЅСЊ РјРѕР»РѕРґР°! - Р�, РЅР°РєРѕРЅРµС†, РµСЃР»Рё Сѓ С‚РµР±СЏ РµСЃС‚СЊ РµС‰Рµ С‡С‚Рѕ-С‚Рѕ РґРѕР±Р°РІРёС‚СЊ РЅР°С€РёРј С‡РёС‚Р°С‚РµР»СЏРј, С‚Рѕ С‚С‹ РјРѕР¶РµС€СЊ СЃРґРµР»Р°С‚СЊ СЌС‚Рѕ СЃРµР№С‡Р°СЃ. - РЇ Р¶РµР»Р°СЋ РІСЃРµРј СЃС‡Р°СЃС‚СЊСЏ, Р·РґРѕСЂРѕРІСЊСЏ Рё Р»СЋР±РёС‚СЊ СЃРІРѕСЋ СЃРµРјСЊСЋ Рё РґСЂСѓР·РµР№! - РЎРїР°СЃРёР±Рѕ Р·Р° РёРЅС‚РµСЂРІСЊСЋ Рё СѓРІРёРґРёРјСЃСЏ РІ РљРёРµРІРµ! ! 22/09 Cypriot broadcaster CyBC has announced running order for the national final to be held on October 3rd, 21.15 local time, in Studio 3 of RIK. It will be hosted by Grigoriadis Christos and Mary Kanther. 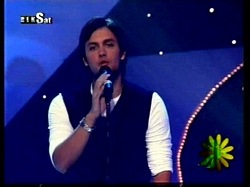 Yiorgos Ioannides, Louis Georgiou, Joanna and band "Triimitonio" will perform as guest of the show. 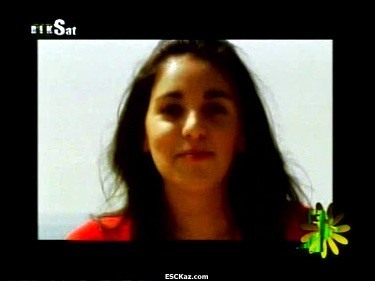 Watch CyBC promo here. All children will also perform theme song "Nikites eimaste oloi" (Winners Are All) written by Marina Charalambous with lyrics by Kiriakos Pastidis. Names of performers are still kept secret, however it has leaked that duet of Elina Solomonidou and Dimitris Pahiourtidis will be singing A Be Pa Blom. Upd: Viewing rankings: 19.5% rating, 5.1% share, 37th most viewed show of the week. РљРёРїСЂРёРѕС‚СЃРєР°СЏ С‚РµР»РµРєРѕРјРїР°РЅРёСЏ CyBC РѕР±СЉСЏРІРёР»Р° РїРѕСЂСЏРґРѕРє РІС‹СЃС‚СѓРїР»РµРЅРёСЏ РІ РЅР°С†РёРѕРЅР°Р»СЊРЅРѕРј С„РёРЅР°Р»Рµ, РЅР°Р·РЅР°С‡РµРЅРЅРѕРј РЅР° 3Рµ РѕРєС‚СЏР±СЂСЏ, 21.15 РјРµСЃС‚РЅРѕРіРѕ РІСЂРµРјСЏ РІ СЃС‚СѓРґРёРё RIK. Р’РµРґСѓС‰РёРјРё РѕС‚Р±РѕСЂР° СЃС‚Р°РЅСѓС‚ Р“СЂРёРіРѕСЂРёР°РґРёСЃ РҐСЂРёСЃС‚РѕСЃ Рё РњСЌСЂРё РљР°РЅС‚РµСЂ. Р™РѕСЂРіРѕСЃ Р�РѕР°РЅРЅРёРґРµСЃ, Р›СѓРёСЃ Р“РµРѕСЂРіРёСѓ, Р™РѕР°РЅРЅР° Рё РіСЂСѓРїРїР° "Triimitonio" РІС‹СЃС‚СѓРїСЏС‚ РІ РєР°С‡РµСЃС‚РІРµ РіРѕСЃС‚СЏ. РџСЂРѕРјРѕ CyBC РІС‹ РјРѕР¶РµС‚Рµ СѓРІРёРґРµС‚СЊ Р·РґРµСЃСЊ. Р’СЃРµ СѓС‡Р°СЃС‚РЅРёРєРё С€РѕСѓ РёСЃРїРѕР»РЅСЏС‚ РїРµСЃРЅСЋ "РњС‹ РІСЃРµ РїРѕР±РµРґРёС‚РµР»Рё", РєРѕС‚РѕСЂСѓСЋ РЅР°РїРёСЃР°Р»Р° РњР°СЂРёРЅР° РҐР°СЂР°Р»Р°РјР±СѓСЃ РЅР° СЃС‚РёС…Рё РљРёСЂРёР°РєРѕСЃР° РџР°СЃС‚РёРґРёСЃР°. Р�РјРµРЅР° РёСЃРїРѕР»РЅРёС‚РµР»РµР№ РґРѕ СЃРёС… РїРѕСЂ РґРµСЂР¶Р°С‚СЃСЏ РІ СЃРµРєСЂРµС‚Рµ, РѕРґРЅР°РєРѕ СЃС‚Р°Р»Рѕ РёР·РІРµСЃС‚РЅРѕ, С‡С‚Рѕ СЃСЂРµРґРё СѓС‡Р°СЃС‚РЅРёРєРѕРІ Р±СѓРґСѓС‚ РґСѓСЌС‚ Elina Solomonidou Рё Demetres Pahiourtidis, РєРѕС‚РѕСЂС‹Рµ РёСЃРїРѕР»РЅСЏС‚ РїРµСЃРЅСЋ A Be Pa Blom. РћР±РЅ: РўРµР»РµРІРёР·РёРѕРЅРЅС‹Рµ СЂРµР№С‚РёРЅРіРё: 19.5% СЂРµР№С‚РёРЅРі, 5.1% РґРѕР»СЏ, 37СЏ РїРѕ РїРѕРїСѓР»СЏСЂРЅРѕСЃС‚Рё РїСЂРѕРіСЂР°РјРјР° РЅРµРґРµР»Рё. Р—РґРµСЃСЊ РІС‹ РјРѕР¶РµС‚Рµ СѓРІРёРґРµС‚СЊ СЂРµРїРѕСЂС‚Р°Р¶ RIK Рѕ РїРµСЂРІРѕР№ СЃС‚Р°РґРёРё РѕС‚Р±РѕСЂР° (РЅР° РіСЂРµС‡РµСЃРєРѕРј). 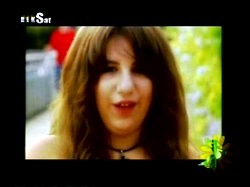 26/05 Cypriot national broadcaster CyBC has launched preselection for Junior Eurovision contest 2009. Deadline to enter is 31st July 2009, according to regulations children born between November 21, 1994 and November 21, 1999 are allowed to compete (which is actually rather wrong, as international rules allow children born after November 21, 1993 to enter competition being 15 years old inclusive). Phase one of national selection will take place on September 5th, when professional jury will listen live to the candidates and will select 8 songs to take part in the national final. 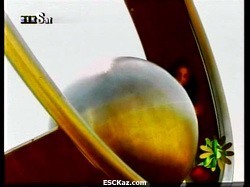 Selection final has been scheduled for 3rd of October and winner will be chosen by 50-50 system. Complete regulations are available here. Upd: the text of regulations has been corrected to include kids born from 22/11/93 till 20/11/99 РќР°С†РёРѕРЅР°Р»СЊРЅР°СЏ С‚РµР»РµРєРѕРјРїР°РЅРёСЏ РљРёРїСЂР° CyBC РЅР°С‡Р°Р»Р° РѕС‚Р±РѕСЂ РЅР° Р”РµС‚СЃРєРѕРµ Р•РІСЂРѕРІРёРґРµРЅРёРµ 2009. РљСЂР°Р№РЅРёР№ СЃСЂРѕРє РїСЂРёРµРјР° Р·Р°СЏРІРѕРє - 31Рµ РёСЋР»СЏ 2009 РіРѕРґР°. РЎРѕРіР»Р°СЃРЅРѕ РїСЂР°РІРёР»Р°Рј РІ РєРѕРЅРєСѓСЂСЃРµ РјРѕРіСѓС‚ РїСЂРёРЅСЏС‚СЊ СѓС‡Р°СЃС‚РёРµ РґРµС‚Рё, СЂРѕР¶РґРµРЅРЅС‹Рµ РјРµР¶РґСѓ 21Рј РЅРѕСЏР±СЂСЏ 1994 Рё 21Рј РЅРѕСЏР±СЂСЏ 1999 РіРѕРґРѕРІ (С‡С‚Рѕ РЅРµ СЃРѕРІСЃРµРј РїСЂР°РІРёР»СЊРЅРѕ, РїРѕСЃРєРѕР»СЊРєСѓ РјРµР¶РґСѓРЅР°СЂРѕРґРЅС‹Рµ РїСЂР°РІРёР»Р° РєРѕРЅРєСѓСЂСЃР° РґРѕРїСѓСЃРєР°СЋС‚ СѓС‡Р°СЃС‚РЅРёРєРѕРІ, СЂРѕР¶РґРµРЅРЅС‹С… РїРѕСЃР»Рµ 21РіРѕ РЅРѕСЏР±СЂСЏ 1993 РіРѕРґР°, С‚.Рµ. 15 Р»РµС‚ РІРєР»СЋС‡РёС‚РµР»СЊРЅРѕ). РџРµСЂРІС‹Р№ СЌС‚Р°Рї РѕС‚Р±РѕСЂР° СЃРѕСЃС‚РѕРёС‚СЃСЏ 5РіРѕ СЃРµРЅС‚СЏР±СЂСЏ, РєРѕРіРґР° РїСЂРѕС„РµСЃСЃРёРѕРЅР°Р»СЊРЅРѕРµ Р¶СЋСЂРё РїСЂРѕСЃР»СѓС€Р°РµС‚ РєР°РЅРґРёРґР°С‚РѕРІ РІР¶РёРІСѓСЋ Рё РІС‹Р±РµСЂРµС‚ 8 РїРµСЃРµРЅ РґР»СЏ СѓС‡Р°СЃС‚РёСЏ РІ РЅР°С†РёРѕРЅР°Р»СЊРЅРѕРј РѕС‚Р±РѕСЂРµ. Р¤РёРЅР°Р» РѕС‚Р±РѕСЂР° РЅР°Р·РЅР°С‡РµРЅ РЅР° 3Рµ РѕРєС‚СЏР±СЂСЏ Рё РµРіРѕ РїРѕР±РµРґРёС‚РµР»СЊ Р±СѓРґРµС‚ РІС‹Р±СЂР°РЅ РїРѕ СЃС…РµРјРµ 50-50. РџРѕР»РЅС‹Рµ РїСЂР°РІРёР»Р° РѕС‚Р±РѕСЂР° РґРѕСЃС‚СѓРїРЅС‹ Р·РґРµСЃСЊ.